If finance is wielding blunt forecasting tools, whether for inventory cost or revenue, the whole picture can crack. There’s an unmistakable buzz in the business community today about big data and business analytics and how the two of them can be used to help marketing people destroy the competition and score big revenue gains. So where does finance come in? Is the financial planning and analysis (FP&A) expert playing coach, quarterback, or bystander? I have strong opinions on this, but first let’s look at how finance has been doing with its traditional performance management toolkit— specifically, the sales forecast. This month’s metric looks at the relative percentage error for the total sales forecast of 410 companies that provided information to APQC, the nonprofit business benchmarking and research firm I work for. The top performers, the top quartile of the total data set, tolerate an error rate of 1.50% of sales or less. APQC data also suggest what many people already suspect: middle-market companies with sales in the $100-to-$500 million range fare worse than their big corporate brethren. Why? Obviously, the smaller the revenue stream, the larger the impact from an unexpected blip such as the impact of a new government regulation on your customers’ readiness to purchase. An example could be a new government standard involving environmental impacts of raw material imported from developing nations. Another possibility could impact a business of any size: a sudden and unforeseeable surge in customer demand that leaves your retailing channels with empty shelves. The sales forecast may have dutifully reflected the level of expected demand. But what if that demand forecast was full of holes? The takeaway may be obvious, but it bears repeating. Whether the FP&A professional is working with simple historical patterns or advanced statistical models for predicting revenue trends, it’s vital to check the underlying assumptions periodically. Dig into those assumptions and drivers as often as indicated by marketplace conditions. And it’s incumbent on the CFO to make sure the FP&A team spends enough quality time in the field, factory, or fulfillment hubs to gain a thorough understanding of steps that occur between the sparking of customer demand and order fulfillment. The FP&A team needs to develop trusting relationships with field sales leaders and operations managers so that finance is wired to pick up signs of emerging issues or incidents that could throw off forecasts for inventory, labor, and logistics requirements. 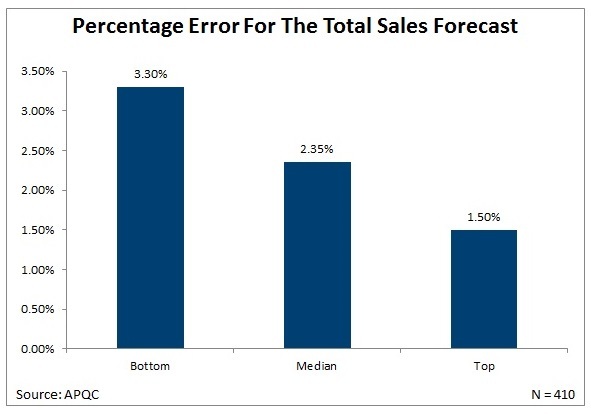 In short, the precision of the sales forecast is only as good as its assumptions are well-founded. What the Metric of the Month this time around suggests is that the top performers have well-established listening posts and signaling systems that are placed adequately upstream in business operations. We are in the era of big data and business analytics. And that gives finance the opportunity to collect and analyze all manner of data in ways that can provide a real boost to those charged with plan execution. Big data gives financial analysts unprecedented opportunities to dig deeper, helping the business take corrective actions and seize opportunities. It gives CFOs more information to keep their enterprises ahead of business risks, securing a strong reception at the strategy table. In short, the old ways will no longer do. Relying on historical costs and sales data – and frankly, a little guesswork — is a risky way to guide decisions about future customer demand, supply and operating costs, and the pacing of gross profit. And CFOs are getting the message. Big data means different things for finance than for marketing, though. Depending on your industry, it might mean tapping into your company’s sales and operations planning platform, or studying global macroeconomic trends that affect your supply chain. Data from multiple sources can, if used properly, provide a stronger feel for cost drivers, whether they are seasonal purchasing or labor trends, workforce availability, or factors that affect the cost of raw materials. By developing data science knowledge in finance, ensuring that FP&A experts have reliable listening posts in operations, and restructuring financial planning and analyst teams to focus more on rich, real-time analytics, smart CFOs are earning greater respect at the strategy table. And that makes big data a very big deal.